Title The / New Testament / of / Our Lord and Saviour Jesus Christ. / First Published by the English College at Rheims, A.D. 1582. 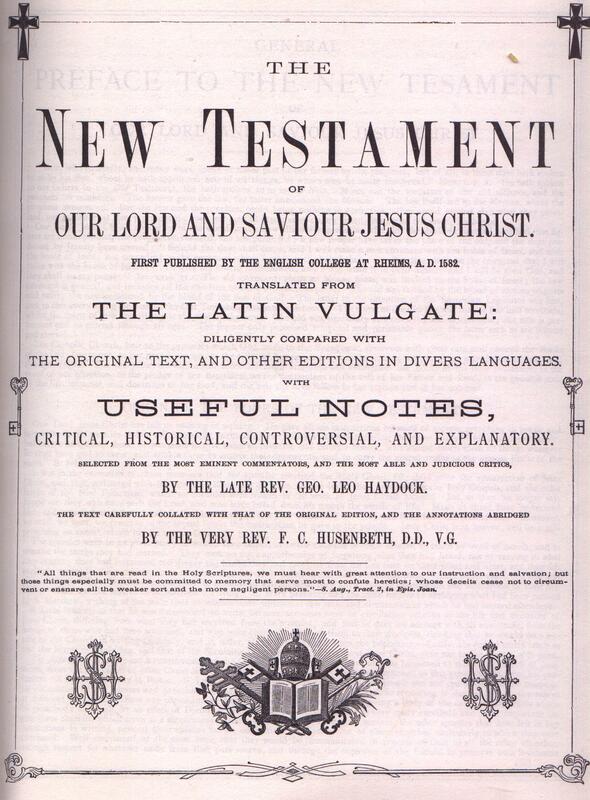 / Translated from / The Latin Vulgate: / Diligently Compared with / The Original Text, and Other Editions in Divers Languages. / with / Useful Notes, / Critical, Historical, Controversial, and Explanatory. / Selected from the Most Eminent Commentators, and the Most Able and Judicious Critics, / by the Rev. Geo. Leo Haydock. / The Text Carefully Collated with That of the Original Edition, and the Annotations Abridged / by the Very Rev. F. C. Husenbeth, D.D., V.G. Publisher Victory Publications, San Marino, Calif. 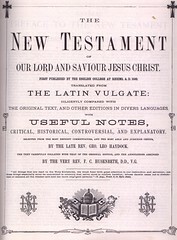 Contents The New Testament in the Rheims Version as revised by Challoner and later by MacMahon with extended annotations compiled by Benedict Rayment and others as abridged by Husenbeth. 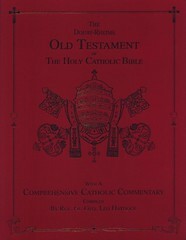 Added is a Catholic Bible Dictionary. 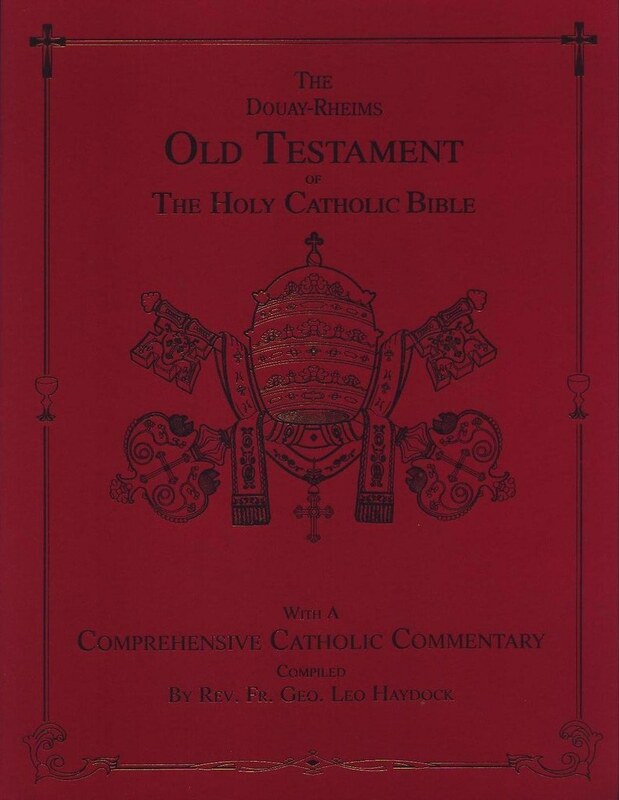 Contents The Old Testament in the Douay Version as revised by Challoner and later by MacMahon with extended commentary compiled by George Leo Haydock. Comments Bound in matching format to the above New Testament to form a complete Bible. However, the Second Quarto Series (q.v.) was used as exemplar. 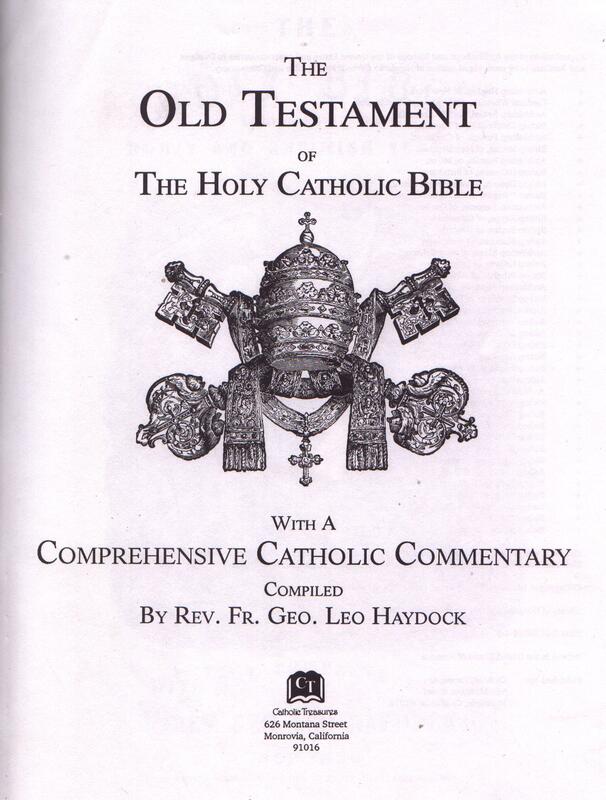 Title The / Old Testament / of / The Holy Catholic Bible / First Published by the English College at Douay, A. D. 1609. / Translated from / The Latin Vulgate: / Diligently Compared with / The Original Text, and Other Editions in Divers Languages. / with / Useful Notes, / Critical, Historical, Controversial, and Explanatory. / Selected from the Most Eminent Commentators, and the Most Able and Judicious Critics, / by the Late Rev. Geo. Leo Haydock. 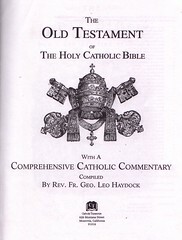 Comments Another edition of the above, with a different title page and issued as part of a complete three-volume set, including the Rheims New Testament and a Catholic Bible Dictionary. The New Testament with this set is from the Second Quarto Series (q.v.) as is the Old. Editions appeared in red paperback (shown) and white hardback. 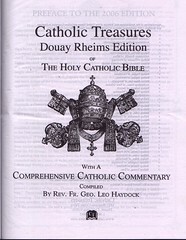 Publisher Catholic Treasures, Duarte, Calif. 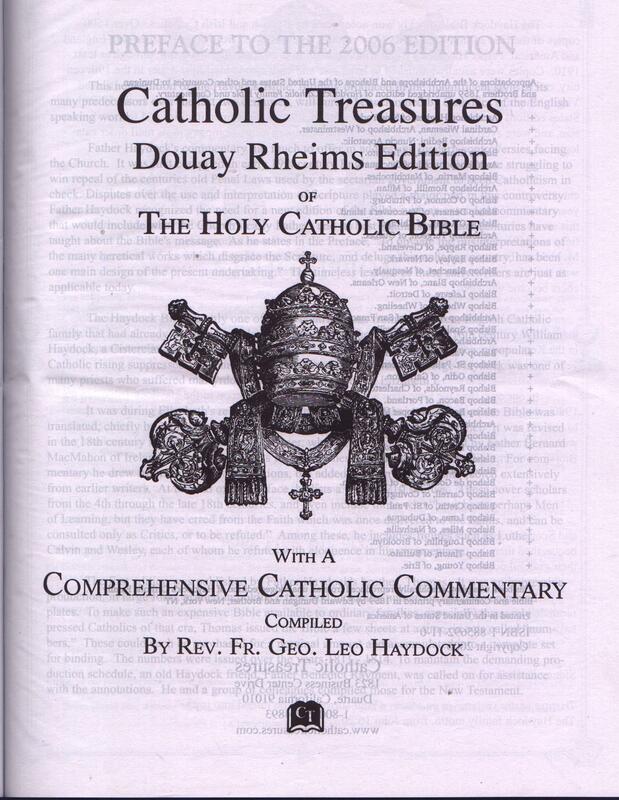 Contents The complete Bible in the Douay Version as reviswed by Challoner and later by MacMahon with extended commentary compiled by George Leo Haydock, Benedict Rayment, and others.